John “Cat’s Eyes” Cunningham was a legendary World War II British fighter pilot. Cunningham’s reputation for nighttime super-vision was largely attributed to a diet high in carrots, though the story was actually created to mask the Royal Air Force’s use of radar to find nighttime targets. People believed the carrot story because even then carrots were widely known to support healthy eyes, and thus vision. This is partially true, and although beta-carotene and vitamin A in carrots helps eye health (a lack of vitamin A is even the foremost cause of blindness), they don’t necessarily improve vision. In a medium bowl, combine shredded carrots, apples and raisins. Gently mix in the nut mayonnaise and salt. Chill a few hours before serving. Place the cashews into a blender. Add the olive oil, onion powder, salt and lemon juice. Blend until creamy slowly adding enough water until a creamy consistency is achieved. In ancient times, carrots were first grown for medicinal purposes, and not for food. Hippocrates taught that to prevent pregnancy women should eat carrots. Modern research has shown that carrot seeds can block progesterone and prevent the egg implantation. Carrots nourish the entire body and help maintain the body’s pH balance. They have also been used in tooth care and treating burns. It is said that eating a carrot right after eating a meal helps to remove food particles from the teeth. Australian researchers fed rats a high-fat, carbohydrate western diet for 16 weeks. The rats became fat, glucose intolerant and developed high blood pressure. Purple carrot juice was then added to the rats’ diet for eight weeks, and to the surprise of the researchers, the rats returned to normal. The results were printed in the British Journal of Nutrition. Carrots are naturally purple, yellow, white and red. The carrot is related to celery, parsley and poisonous hemlock. 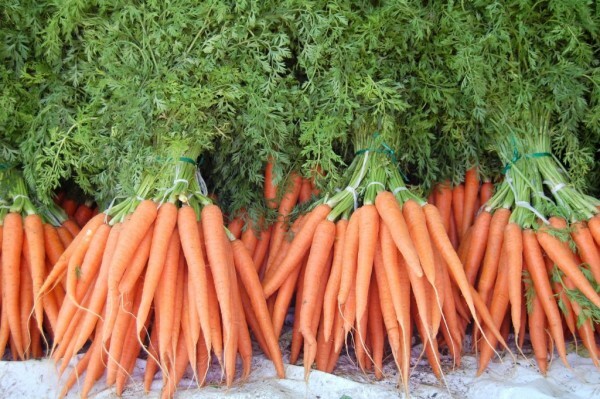 While most people think of carrots as being orange, that is not the original color. Evidence of purple carrots date back to 5,000 years ago in Afghanistan, and this is thought to be the original carrot color. It is said that to honor the Dutch Royal Family, the House of Orange, Dutch farmers crossed the red and yellow carrots to create the orange color that we are familiar with now. Dutch travelers took the new orange carrots throughout Queen Elizabeth I’s England. They even became a fashion accessory, as women used carrot tops as hat decorations. Maybe this is where the term carrot top began. No matter why carrots are eaten, two things can be learned. One: carrots are good for health and two: carrots are sweet. They are the second sweetest vegetable after the beet. There are many different ways to eat carrots. My favorite is raw, but they can also be baked, juiced or roasted. I love to use carrots in salads, sweets and main dishes. When rainbow carrots or other colored carrots can be found I like to use them instead.